What a cute German Shepherd puppy don't you agree?! Sole was born on March 10,2014 and became the first member of my family since my husband and I got married on March. We live in Puerto Rico where the weather is primarly hot so i suppose that is why she likes to drink water and to inmerse her face and paws inside the cup every time. Loves to play, destroys any toy we had given to her and chews almost everything she finds in her place if we dont keep an eye on her. We will be taking her to her first training session this saturday and hope she will be able to follow commands very soon and make us more happy than she has already. Thanks for writing in to us here and sharing a little bit about the story of your new German Shepherd puppy. Congratulations on your new GSD puppy, Sole. She is a cutie for sure. And you are doing the right thing in signing her up for training classes! Way to go! German Shepherds are extremely smart dogs and love to learn new things. And by training her you will be making your life so much simpler and happier in the future because training and good manners are soooo important. :) So good luck with the training classes. Feel free to read through all the wealth of information inside this site to learn all that you can about German Shepherds - training, health issues, products, etc because so many of these may be of importance to you at one time or another in your dogs life. Continued success with your newest family member!! 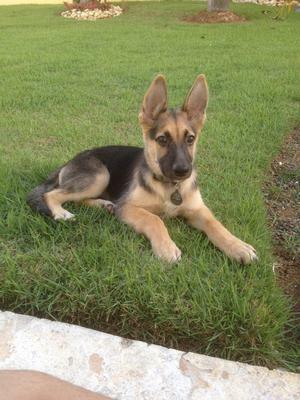 And have fun practicing your puppy training and playing with your German Shepherd puppy, Sole!! She is adorable.